Yojiya Gion is a shop located in the center of Gion. Founded in 1904, it is a long-established store known all over Japan, and its logo is very famous. The logo represents the image of a woman reflected on a hand mirror, an essential beauty item. The store sells cosmetics and related miscellaneous goods, and its primary product is blotting paper. Blotting paper is a type of paper that, when placed on the skin, removes excess sebum, and it is effective in maintaining the skin clean at all times. 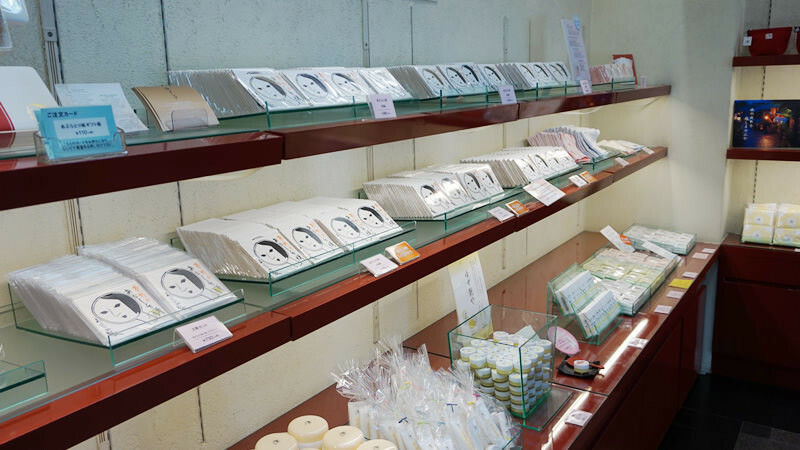 Yojiya’s blotting paper is of the highest quality, which makes it a long-seller with a large number of fans. Besides blotting paper, the store offers a plentiful lineup of other products, such as lip colors, lip creams, shampoo, hand cream, and miscellaneous goods like mirrors. Since they have small products and gift sets too, this is a shop that we would also like to recommend if you are looking to buy someone a gift. Place a sheet of blotting paper on your skin and press lightly to remove excess sebum without affecting your makeup. These are made using special Japanese paper, which makes them highly absorbent and gentle on the skin. The booklet comes in a small size, which makes it easy to carry them around. 1 booklet (includes 20 sheets) are also sold separately. Portable hand mirror sized to fit in a pouch. It is cutely decorated with the shop’s logo. It is available in 3 different colors, all of which are vibrant and beautiful. *Smaller hand mirrors sized to fit in just one hand are available as well. Yojiya’s cosmetics are loved by Kyoto’s Geiko and Maiko, and by Kabuki actors. The lip colors are available in 10 different shades with traditional color names. All of them offer great pigmentation, and look beautiful and glossy. This soap is in sheet form that can be used on both the hands and the face, and it can be easily used when traveling. It does not contain any artificial scents, coloring, or preservatives, which makes it gentle on the skin and safe for children as well. The descriptions of the products are available in a total of 5 languages, including English and Chinese. The store also offers several items for men such as face foam cleansers and toners. You will find blotting paper and other cosmetic-related miscellaneous goods on the 1st floor of the store and makeup tools such as lip colors and skin care items on the 2nd floor. They have testers available for some products, so you can try them before buying. The best store for souvenirs has to be this! Yojiya's blotting paper is almost too famous. They sell many great cosmetics beside blotting paper, but my recommendation is their eau de toilette! The elegant fragrance is somewhat sweet, but a natural fragrance, so I really like it! The mini-size can be bought for 1200 yen so I think you can buy it for a souvenir or for yourself. The shop's logo is quite an interesting take on the face of a geisha, and they have their logo on most of their products. The look of their products is very unique so they should make good souvenirs. English-speaking and Chinese-speaking staff available.